Hotel Los Mangos opened its doors this May 2014, operated by Epic Adventures Surfing. It is the only Eco Boutique Hotel in the area, with elegant design and luxurious atmosphere that seeks to provide customers a cozy and intimate stay; moreover you will find quality and personalized services. Enjoy our spectacular morning sunrises and beautiful evening sunsets. Epic Surfing Adventures has become one of the leading surf tour operators in El Salvador over the last 10 years. Epic organizes surfing tours in La Libertad and the Eastern coast covering the entire coast of El Salvador. There are also possibilities to do kayak tours, hiking in the nature and cultural tours. 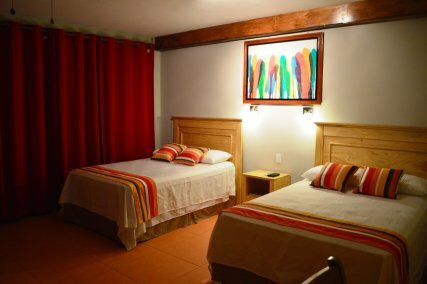 Los Mangos was created with the aim of offering its customers the perfect place to stay, as the Hotel is located at a strategic point where to find the best surf point named Punta Mango in El Salvador. Tucked away where forest meets beach, after driving 25 min on a dirt road you will find the Point break of Punta Mango with Hotel Los Mangos overlooking it. The break has a rock beach and point aside which makes the waves fast, hollow and for more experiences surfers. For beginners the beach break can be very fun! 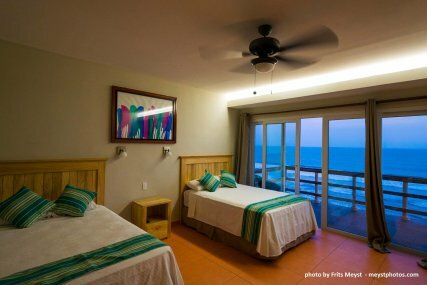 We are perched on a cliff on El Salvador’s eastern pacific coast, overlooking the surf beach below and surrounding tropical landscape.We are 9km from El Cuco beach in eastern El Salvador. It contains 2 double beds. It contains 1 double beds. We provide Airport Transfers from and to Comalapa, Airport and they can be booked in the booking steps. Beach of Las Flores or Los Mangos are an excellent place for beginners or experienced surfers. These beaches are long and sandy bottom. We have experienced bilingual instructors which provide surfing lessons safely. We have different surfboards for rent, each of different models and sizes, of which the customer can choose according to the level of experience you have in surf. Rainy season is May to October. It is when the surf is also at its best. Your balance is due to the property 20 days before arrival. The Property will contact you to collect payment. If you book within this 20 days then the property will contact you shortly after you book to collect the balance. I look forward to welcoming you to our surf paradise!